New York Appellate Division Justice Bernard "Bud" Malone. Well, not what you might think. Not what you might presume about a judge who sticks his neck out to disagree with his colleagues, and to side with someone convicted of murder. No, he's not some crusading liberal. Judge Malone is a Republican. He's a former federal prosecutor. He was appointed to the appeals court by Republican Governor George Pataki who appointed law and order judges. His record on the bench is somewhat conservative. And Judge Malone is an Army Vet. He had the guts to dissent. And he was vindicated, 7 to 0, by the Court of Appeals, New York's highest Court. Court watchers, including myself, found Judge Malone's dissenting opinion compelling. It was no doubt crucial to the decision ultimately reached by New York's court of last resort. Malone's dissenting opinion was one of the very strongest, most comprehensive, most civil, most fair, and most persuasive that we have read in quite some time. And it resulted in--what we believe--to be the correct ruling by the state's highest Court. [See Steve Reilly, Appellate court judge may have played key role in overturning Cal Harris' conviction, Oct. 20, 2012, available on Gannett's pressconnects.com. The background facts of the murder case are spelled out in Steve Reilly and Nancy Dooling, Appellate Division affirms Cal Harris murder conviction, July 28, 2011, also available on Gannett's pressconnects.com. Lest anyone now think that the Court of Appeals must be comprised of "criminal coddlers" to be siding with Malone's dissent to overturn the murder conviction, a few realities are in order. Four of the 7 Judges on New York's high court were appointed by Republican Governor Pataki--again, intent on appointing law and order Judges. None of those Judges could be accused of being liberal. The remaining 3 were appointed by Democratic governors--1 each for Mario Cuomo, Spitzer, and Patterson. And who authored the opinion for the Court of Appeals? And just who is he? Well, like the Appellate Division dissenter Judge Malone, he's no crusading liberal. Indeed, Judge Pigott's profile would sound a lot like Malone's. From being a Republican, to being appointed by Republican Governor Pataki, to compiling a fairly conservative--pro-law enforcement--record on the bench. And to being an Army Vet, serving in Vietnam. [See Michael Cooper, Pataki Appoints Fifth Republican to Highest Court, NY Times, Aug. 8, 2006. Yes, I'm a Democrat. Yes, a liberal. Yes, I prefer judicial records that are somewhat less conservative than that of Judge Malone, or of Judge Pigott. And yes, I thought former Governor Pataki's public ranting against activist judges who favor criminals over victims was absolutely shameful. And I think his record of judicial appointees was far too partisan, and hardly stellar. But in appointing Judge Malone to the Appellate Division--and Judge Pigott to the Court of Appeals--I think Pataki made 2 of the best decisions of his 12-year tenure. Judge Malone's courageous, certainly unpopular, meticulously argued, and ultimately vindicated dissenting opinion in People v. Calvin Harris demonstrates the importance of an independent judiciary, with independent-minded, wise, and exquisitely fair Judges. And Judges who are not afraid to stand alone. Judge Pigott's opinion for the Court of Appeals--concise, straightforward, non-nonsense (like himself)--was certainly more than enough vindication and congratulations for Judge Malone. Certainly more than I can offer. Nevertheless, let me offer my own Bravo! to Judge Malone. You did noble. Very noble. [I've discussed the nature and value of dissenting opinions many times on New York Court Watcher and elsewhere. See, e.g., Lippman's Goat--What Gets It? (Part 2: Criminal Cases), Sept. 19, 2011. As for Governor Pataki's bashing of liberal Judges, see, e.g., the discussion and references in NY Court of Appeals: Granting Criminal Appeals--Up, Down, Now Up Again? (Part 7: Pataki's Attack and The Court's Retreat), Dec. 5, 2009. Disclosure: I know both Judge Malone and Judge Pigott. I don't socialize with either of them, but I personally like the two of them very much and have a very high professional regard for them as well. As for Judge Malone, he is also an alum of Albany Law School and has served as a trustee. Additionally, his law clerk is a former student and one of my favorites. 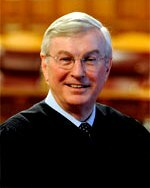 As for Judge Pigott, he's from the Buffalo area, like former Court of Appeals Judge Matthew Jasen for whom I clerked, he knew Judge Jasen, and he has spoken glowingly about him as his favorite Judge in the Court's history--that, of course, endeared Judge Pigott to me even more.